Because I believe in healthy teeth and gums, I periodically review oral care products. I enjoy getting to see just what is being offered and because I have a toddler I love to see what is out there for her as well. She is VERY nervous when it comes to doctors and we have yet to visit the dentist. So, I take time with her each night flossing, brushing and counting her teeth. :) She loves it (so far) and it gives us some special time together. Hopefully by the time I take her to the dentist her teeth will be healthy and looking great too. When I went on an internet search the other day for "Organic Toothpaste" I found a really neat company. Today I am going to introduce you to Dr. Sharp Dentistry...a company with fluoride-free oral care company that was founded by an aesthetic dentist named Dr. Bruno Sharp. 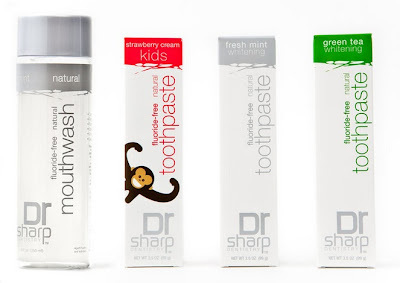 Dr. Sharp Dentistry offers fluoride-free, Sodium Lauryl Sulfate free, paraben-free and alcohol-free oral care products. This company gives you some really sophisticated options when it comes to caring for your teeth. We offer you a sophisticated approach to natural oral care, courtesy of Dr. Bruno Sharp, Miami’s leading aesthetic dentist. His vision and dedication to the demands of educated consumers combines decades of experience with advanced technology – all of which has created some of the most cutting-edge, doctor-endorsed oral health products available today. Our philosophy is simple – by caring deeply about our environment and its effect on your health, we have dedicated ourselves to providing you with innovative and proven alternatives to fluoride-based products. That’s why our toothpastes and mouthwashes are made with natural ingredients and herbals that harness many of the restorative and nurturing qualities found in nature. The ingredients we use are vegan and not tested on animals. Our commitment to sustainability also extends to the packaging we use – our boxes are printed with soy ink, and our bottles are PBA-free. Also, the packaging and components for our toothbrushes and tongue cleaner are recyclable, except for the bristles. I just love how this company is focused on using eco-friendly products and ingredients. It sure makes me want to try what they have to offer! With fluoride being such a harmful additive to toothpastes today it is nice to finally have a toothpaste that is free of that! YAY! I was very excited to try these out as I am always looking for that "perfect" toothpaste! So, the first product I tried was the Green Tea Whitening Toothpaste. This toothpaste is made with natural tea tree extracts, echinacea, and myrrh...all which soothe and provide antiseptic, bactericidal and fungicidal properties. I know how wonderful echinacea is for my health so I think that having it in the toothpaste is great! The flavor of this toothpaste is too herbal tasting for me though. However, my teeth feel super clean after using it so I really liked that! I think that if you are a fan of green tea you will LOVE this toothpaste! Then, I decided to let Hannah try out her Strawberry Cream Kids Toothpaste. She was VERY excited!!! I put some on her toothbrush and she started to brush. Her mouth kind of puckered up and she mumbled to me through the bristles "Momma, Hawna no yike it". That means she didn't like it. :( She did finish brushing and I kept telling her how good it was for her. I think part of the problem is that she is used to the gel toothpaste that is super bubbly gum flavored and this was very different from that. I tried it myself after she finished and it did have an odd taste to it...didn't taste too much like strawberry to me. But again, it really made my teeth feel great. The Fresh Mint Mouthwash is definitely different in flavor. It is not super minty and really feels tingly in your mouth. There is a slight after-taste that lingers for about 15 minutes after using it but it freshened my breath nicely. This mouthwash contains Witch Hazel, licorice and sage, along with aromatic mint flavoring. 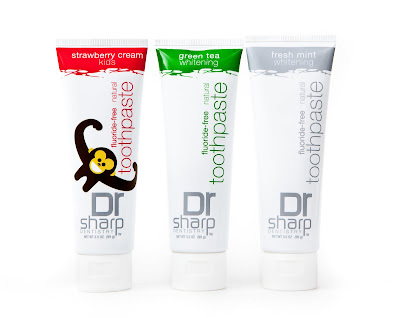 My ultimate favorite Dr. Sharp product had to be the Fresh Mint Whitening Toothpaste. This stuff is AWESOME. It is super minty and after eating onions for dinner I couldn't even tell after brushing!! This toothpaste contains aromatic mint oil, sage leaf extract and carrageenan (a seaweed extract). I love how there are organic botanicals in these products! That makes them sooo great for you! All of these products can be purchased on Dr. Sharp's website, and are also available at select locations around the world. You can view a map of locations HERE. This code is valid until June 15, 2010. So, in my opinion...Dr. Sharp Dentistry is a wonderful company! While I didn't care for the mouthwash or the Green Tea Toothpaste, I was very impressed with the way they left my mouth and teeth feeling. I know that sometimes, things that are really good for you don't always taste the best but are THE BEST for your body. So, I can live with that and will continue to use those great products! Visit Dr. Sharp Dentistry and leave me a comment telling me what you would love to try. You do not have to be a blogger to enter, but you must have a valid email where you can be reached should you win. If you do not leave an email address, it must be where I can easily find it. This giveaway is open to US residents and will end 6/6 at 11:59 pm EST. The winner will be chosen using random.org and will be notified by email. The winner will have 48 hours to respond, or another winner will be selected. Want to increase your chances of winning? Here are some Extra Entries! 1. "Like" Dr. Sharp Dentistry on Facebook. 2 entries, so 2 comments. 3. Become a GFC follower of My Opinion. Leave a comment to let me know that you did/ do. 3 entries, so 3 comments. 5. Tweet about this giveaway. Leave a comment with the link. 1 tweet per day. 1 comment per day. 6. Blog about this giveaway. Leave a comment with a link. 5 entries, so 5 comments. 7. Vote for me on Picket Fence Blogs. 1 entry per day, so 1 comment per day. Disclaimer: I received no monetary compensation for this post. I did receive Dr. Sharp Dentistry Products for review purposes. All quotes are from the Dr. Sharp Dentistry website and email. All thoughts and opinions are 100% mine. I would like to try the Fresh Mint Whitening Toothpaste. I follow Dr. Sharp on Twitter as BookOwner. I follow you on Twitter as BookOwner. The Mint Alcohol Free Mouthwash is what I would like to try! I would love to try the Fresh Mint Whitening Toothpaste. I follow on gfc #1. I follow on gfc #2. I follow on gfc #3. I want the Fresh Mint Whitening Toothpaste. I would love to try the Fresh Mint Whitening Toothpaste and get a Eco Bag Monkey Tote! 5. Tweet about this giveaway. I'd actually really like to try the Green Tea Whitening Toothpaste. I'm not a huge fan of mint, though everyone else in my house is and I like different flavors of toothpaste. Email in profile. i would love to try the green tea whitening toothpaste! I'd like to try the whitening toothpaste. You have just voted for In My Opinion...! I want to try the mint mouthwash. I would really like to try the Fresh Mint Whitening Toothpaste - I like that it's good for sensitive teeth! freash mint whitnING TOOTHPASTE TY. I'd like to try the green tea whitening toothpaste. I would love to try out their Fresh Mint Whitening Toothpaste. Get Your Man Looking Good With Gillette! COVERGIRL + Olay = GORGEOUSNESS!! This Past Week's Giveaway Winners! Enter to win Sand B Gone! FREE 8x10 Photo Collage from Walgreens! Enter to win Chicken Soup for New Moms! Get The Look YOU Want With Clairol!